I’m participating in a long three-day writing conference in Philadelphia this weekend. It’s my first year attending, and I’m very nervous. Yes, I’m a writer, a poet who sometimes writes song lyrics, and a blogger for eating good foodstuffs. But, am I good? 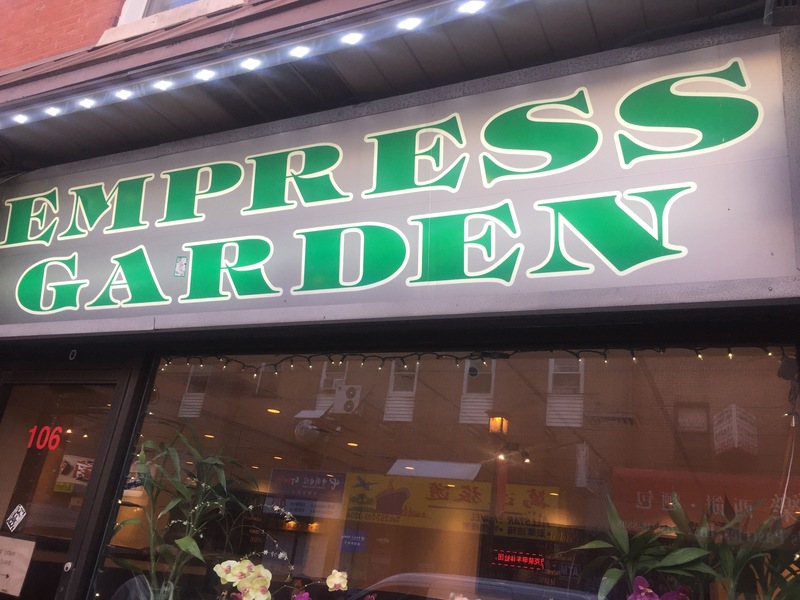 After a mile-long walk from the hotel, we headed towards Chinatown (North 10th Street, right past the bus station), where we stopped by Empress Garden. “I have been dreaming about the scallion pancakes,” Katherine cooed. I will have to say, they were amazing. So was my dinner: a combination dinner with 1. beef and broccoli, 2. fried rice, 3. shrimp roll, and 4. free hot chrysanthemum tea. Unlike a lot of beef dishes from most Chinese restaurants, the beef did taste and have the actual texture of real beef, and the broccoli was streamed beautifully, with a nice sauce. It was indeed excellent, as well as the fried rice and the shrimp roll (it had a real tiny shrimp inside with crispy cabbage!). Everything was hot and plentiful. I now do concur. 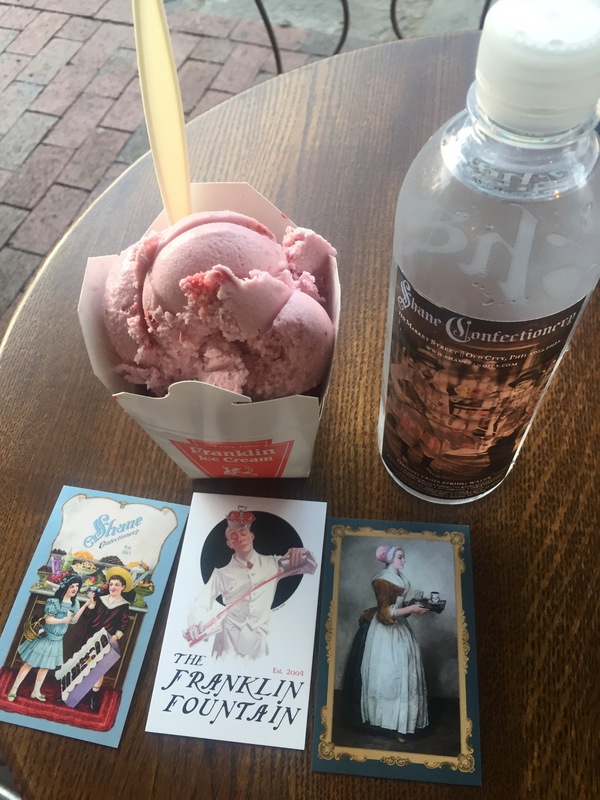 Franklin Fountain is amazing. A mecca of homemade ice cream delights and fountain drinks (established in 2004) in old-timey style in Old Town, where young people rule and have revitalized the town with cute, hip stores and shops by the riverside. The vegan strawberry (with whole berries, yum) and the red raspberry ice were to die for. “In early July, the fresh blueberry ice will be available. It’s intoxicating…” the bespectacled blond girl cashier with lip piercings commented. Also, at Shane Confectionery (two doors over from Franklin Fountain , est. 1868, and now owned by the Fountain), all candies and chocolate drinks (which I partook a 4 oz. one) are homemade, thus very expensive. The cocoa was extraordinary; I ordered the “Aqua di Nicguaqua” (fresh cocoa, coconut milk and cinnamon). 4 oz. for $7. I know I won’t regret tonight! Previous Post The Hungry Librarian Abroad: To all the dishes I’ve loved before…but I still can’t recall : in Venice (5/17/17), in Florence (5/20/17) and in Sorrento (5/22/17).